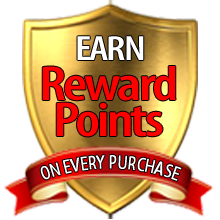 Reward Points are the bonus that you receive in your account for buying products in the store. Each purchase you make earns Reward Points that you can spend like real money in our store. You can choose to apply your points to your next eligible product purchase, or you can let your points accumulate. Reward Points may be combined with any other discounts we may offer because they are not really a discount. Reward Points are a reward from us, thanking you for choosing to make your magic purchases at Rings N Things. Your Reward Points will be updated with points earned from new purchases the moment that your order ships. When products you purchase indicate a value in Reward Points, this represents how many points you earn from purchasing the product. Your Reward Points earned are stored and reported in your Account. Once you have signed into your account, you will see a link for My Points in the My Account menu. This link reports how many points you have available in your account. Clicking on this link will take you to the Reward Points Log. This log reports the points earned from each of your orders and the orders in which you redeemed your points. Points won't appear for new purchases until your order has shipped. When products you purchase indicate a Price In Points, this represents how many points you can redeem towards purchasing the product. Once you have added a product to your shopping cart that can be purchased with points, and signed into your account, you will see a link for Point Payment in the shopping cart and on the checkout page. Clicking on this link will expand or compress the form for applying your points to your purchase. Click on the link to expand the form and it reports how many points you have available in your account and gives you an input field where you can enter a number of points to redeem. Enter the number of points you would like to redeem. Click the "APPLY" BUTTON and your order total is recalculated. The number of points in your account will not change until you have completed checkout. To view your redemption history, click the My points link in the My Account menu after signing in. The Reward Points log will report the orders that earned points and the orders in which you redeemed the points. Remember, points won't appear for new purchases until your order has shipped. Rings -N- Things wants your purchase to be worry-free. The products we offer are in stock and available to ship immediately and we promise to ship your order the next business day whenever possible. Some of our products are bare metal and require their finish to be touched up prior to shipping. Those products many take one additional day to ship. In the rare instance that your order has not been delivered within 30 days of shipment, we will consider the order lost and replace the lost shipment as quickly as possible. Rings -N- Things will ship to all US states and territories. If you can select your state from the list when you are setting up your account's shipping address then we ship there. Shipping is calculated by weight and destination using United States Postal Service Rates and UPS Rates. Ohio state taxes are not included in our shipping rates. As an Ohio Limited Liability Corporation, we are required to collect and pay Ohio state sales tax if your order is being shipped to an Ohio address. First Class Mail is only available as a shipping method for orders under 1 lbs. If your order is over 1 lbs., this option will not be available to you. If you prefer First Class shipping and your order is over 1 lbs., consider dividing your order up into smaller separate orders. First Class Mail now includes Tracking for no additional fee. USPS Priority and USPS Express both include Tracking. When you purchase USPS Priority or USPS Express, you will receive a copy of the USPS Tracking number which you can use at USPS.com to track your order. There are a no additional handling charges on orders. Rings -N- Things will ship to most international locations. If you can select your country from the list when you are setting up your account's shipping address then we ship there. Shipping is calculated by weight and destination using United States Postal Service Rates. 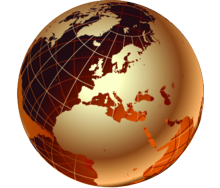 Import/Export taxes are not included in our shipping rates. Your country may impose an import tax on the value of your order. Please do not ask us to under-declare the value of your order. First Class International is only available as a shipping method for orders under 4 lbs. If your order is over 4 lbs, this option will not be available to you. If you prefer First Class International shipping and your order is over 4 lbs, consider dividing your order up into two separate orders. First Class International will usually only track to the border of the US via the US Customs Declaration number. Priority International and Express International both include order tracking that is usually updated all the way thru to delivery at your door. There is a no additional handling charge on international orders. Please allow extra time for delivery of all international orders. Rings-N-Things wants you to be satisfied with every product we make. 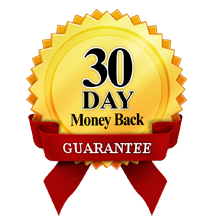 Our 30-day money back guarantee gives you time to make sure the product is in perfect condition and fits your needs. If you need to return it for any reason, we will happily replace, refund, or credit your account for the full value of the item you purchased. If for any reason you are not satisfied you can return any item, without custom monogramming and in its original condition, within 30 days of the date of shipment for a credit, refund or replacement. It's that simple. The item must be returned in good condition and with all paperwork, parts and accessories to ensure full credit. Please see our Return Instructions and Return Exceptions below before returning your item. DVDs will be accepted as a return if the package is unopened, or as a replacement if the DVD is defective. If you receive a damaged or defective item, you may request a Return Authorization immediately. Rings-N-Things will make every reasonable effort to assist you with your return. Read our Return Instructions to request a Return Authorization. The Paul Fox Cups are one of the most popular and sought after style of cups for the cups and balls. The Original Paul Fox cup design, as once made by Danny Dew, was among the first cup designs created exclusively for cups and balls performers that featured a rounded top. Since its conception and manufacture, many magicians have credited the Paul Fox cup design as revolutionizing the world of Cups and Balls and many have contributed moves to the performance of cups and balls that can best be accomplished with a rounded top cup. Each cup is hand spun from the original RNT II tooling in .050 copper. The outside is polished to a Mirror Finish. The inside has a brushed satin finish. This classic set of cups will take lacrosse balls as a final load. 3 x Paul Fox Cups. © 2009 - 2019 Rings-N-Things Magic. All rights reserved. A Magpie Magic Company.